Werner Herzog is a filmmaker who explores the extremes of human behaviour, always looking to the darkness of the human heart and the absurdity of existence. So it's unsurprising, and perhaps inevitable, for him to make a film about death row, where the experience of life and death is intensified beyond the everyday. Into The Abyss: A Tale Of Death, A Tale Of Life is his take on the American capital punishment experience. The film traces the October 2001 murders of Sandra Stotler, her son Adam and his friend Jeremy Richardson, by Michael Perry and Jason Burkett. They were killed because the two teenage boys wanted to steal a car. It was this nihilism, the director said in a Q&A that followed the screening, that drew him to basing the documentary around this particular case. It is not - and he's made this clear - a campaigning film, but does add a rarely seen perspective on the death row system. While Into The Abyss feels less like a documentary directed by Herzog than, for example, Grizzly Man (2005) or Encounters At The End Of The World (2007), it is this understatedness which gives the film its power, elevated far beyond the true crime genre alongside Errol Morris' exemplary The Thin Blue Line (1988) and Paul Hamann's Fourteen Days In May (1987). What makes Into The Abyss distinctive from these two earlier documentaries is that the horror is not driven by the story of one person with whom we empathise. Fourteen Days In May ends with the execution of Edward Earl Johnson, whose calm stoicism in the face of injustice gave the documentary so much power, and whose claims to innocence were far more convincing than those of Michael Perry. It's hard to come away from Fourteen Days In May without a deep sense of outrage at the "machinery of death". On the contrary, Herzog makes it clear to Michael Perry that he doesn't have to like him, and indeed doesn't seem to. In interviews he goes so far as to say that Michael Perry "is the most dangerous of all the people I've ever met". This mitigates against the documentary becoming too engrossed in Perry's particular situation. It makes it more than about just one man. The horror here is more diffuse. The eponymous 'abyss' is not just the darkness that Perry faces on the gurney, but the abyss at the heart of human existence. Nearly all of the people interviewed have been traumatised by the abyss. From the victims' families, to the father of Jason Burkett, to the barmaid who went for a ride in the stolen car, to the former member of the execution team, to the murderers themselves - everyone talks of cutting themselves off from the world, shutting down. There is too much darkness in what they have experienced. Sandra Stotler's daughter explains how she couldn't have a telephone in the house for fear of what would be at the other end. Fred Allen, a former member of the execution team, talks about shutting himself off from his emotions in order to carry out his duties. Like many former death squad members in the United States, Allen is now an opponent of capital punishment. What Herzog captures so well is not simply the singularity of this situation, but the ubiquity of the numbness that surrounds the execution process. It is mechanistic and cold, and those involved have to detach themselves from their emotions in order to cope with the abyss that they face on a daily basis. This results in not only the dehumanisation of the condemned, but in the dehumanisation of everyone around him. Fred Allen's breakdown following the execution of Karla Faye Tucker, when he started to see the faces of all the people he had tied down to the gurney, and presumably the chair before that, is not uncommon among onetime execution staff. Unsurprisingly for a film set in the fundamentalist heartland of America, religion - the evocation of God - appears again and again. Coming from a society without capital punishment, in which religion is seen as an embarrassing throwback to the past, it can be difficult for audiences to comprehend its importance to those in the orbit of the execution process. When all you have in front of you is four white walls followed by a gurney, belief in an afterlife offers solace that few other things can bring. And when you are murdering people for the state, it is only God that can be turned to for forgiveness. In filming Conroe, Texas and interviewing some of its inhabitants, Herzog brings to the screen a rarely viewed side of the USA. The crime scene footage, with its grainy and shaky camera, elliptically focusing on parts of bodies but never quite going the whole way, conjures up the murders' bleakness – it could have been shot by Herzog himself, though it's undoubtedly the mastery of editing that produces such powerful effects. The director also attempts to portray Conroe's remoteness, but he is less successful at conveying the total sense of isolation in the tiny towns scattered around the area. In the long shots of the Texan countryside Herzog seems to be attempting to evoke the strangeness of such an enclosed world. But he fails to entirely communicate the claustrophobia of actually being there - the smallness of the world. Humour plays an important part in heightening the overall sense of absurdity. There are moments when it becomes unquestionably a film made by Werner Herzog. "Tell me a story about squirrels," he asks the pastor who will accompany Perry to the death house. "Tell me how his hands feel," he asks the wife of Jason Burkett. It is this type of questioning that lets Herzog draw out aspects of humanity that remain hidden for other directors. Despite his absurd lines of inquiry, this isn't a work punctuated by Herzog's trademark 'ecstatic truth', perhaps in acknowledgement that the truth of the crime and execution process is far too excessive to warrant any fabulation. While Herzog maintains that Into The Abyss isn't a campaigning film, it certainly has a powerful underlying message. The abyss is everywhere, not just in the execution chamber; it is always just around the corner, a potential threat for everyone. What the execution process does, with its dehumanisation and mechanisation of death, is place the abyss at the centre of the justice system, right at the heart of society. Into The Abyss opens in UK cinemas today; a full list of screenings can be found here. 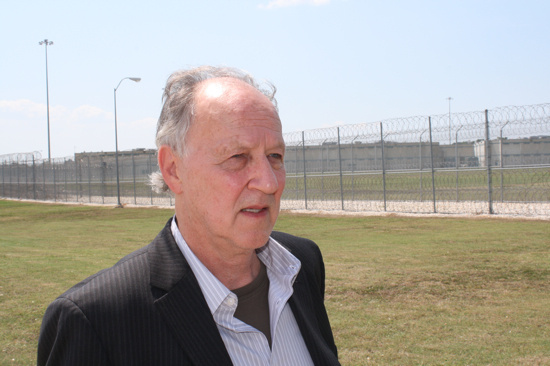 Werner Herzog's TV documentary series Death Row is currently airing on Channel 4.